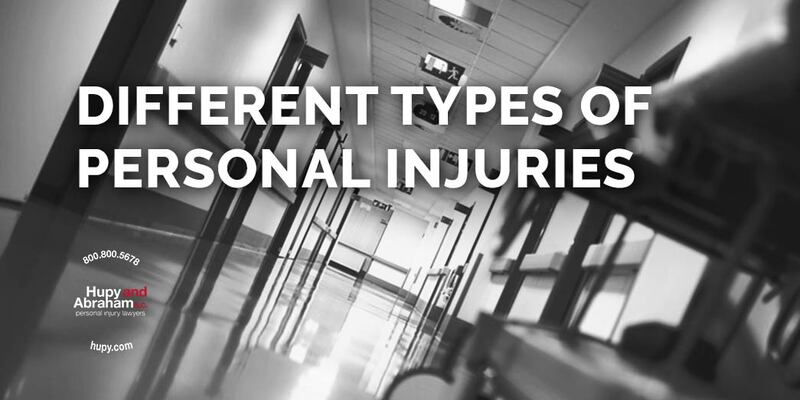 Different Types of Illinois Personal Injury Accidents | Hupy and Abraham, S.C. Sometimes you get hurt and there is no one to blame. It was just an unfortunate, painful, and possibly expensive accident and you have no choice but to pay your own expenses or to look to your own insurance company for compensation. However, if someone else’s negligent or intentional actions (or inactions) caused your injury, then you shouldn’t be left with the bills. Instead, you may have the legal right to pursue a recovery in an Illinois circuit court. Our experienced lawyers can help you determine if you have a legal case and we can help you protect your recovery before the Illinois statute of limitations expires. Have You Been Hurt in One of These Kinds of Accidents? Car crash. An auto accident that is caused by another driver may result in your recovery. A driver could be negligent and you could have a cause of action if, for example, the driver is drowsy, drunk, or distracted. Anyone who is hurt by a negligent driver—including bicyclists and pedestrians—may be able to recover damages. Motorcycle wreck. Many motorcycle crashes are caused by negligent drivers. Drivers who fail to look out for riders can cause significant crashes and injuries. Riders and passengers who are hurt in by other negligent drivers may have the right to recover damages. Truck crash. Truckers, trucking companies, truck manufacturers, and truck mechanics all play a part in preventing truck accidents and may be accountable for crashes that occur. Truck accidents can be catastrophic because of the size and weight of the truck and those who are hurt in these types of crashes may be able to recover damages in truck accident lawsuits. Prescription medication or medical device. Even medications and medical devices that have approval from the Food and Drug Administration (FDA) may cause serious injuries that patients were not warned about. These causes often turn into class action cases because many people have been hurt by the defective drug or device. If you’ve been hurt then you may be able to start or to join a class action case and recover damages. Dog bite. Dog owners have a duty to prevent their pets from harming other people. If you did not provoke the dog and you were bitten or otherwise injured then you may have a case and you may be able to recover damages for your injuries. Slip and fall. Slip and fall cases can be hard to prove, but if you fell due to a property owner’s or a property manager’s negligence then you may be able to recover damages for your injuries. Negligent security incident. Property owners have a duty to provide reasonable security on their properties. This could include things such as fences, alarms, lights, and security guards depending on how the property is used and where it is located. If you’ve been attacked or hurt on a property that did not have reasonable security in place, then you could have a negligent security case. Nursing home abuse or neglect incident. Nursing homes and nursing home staff have a duty to provide reasonable care to residents. When that duty is breached and when a resident is hurt or killed as a result of abuse or neglect, then a nursing home abuse or neglect case may be filed in an Illinois court. Incident that resulted in your loved one’s wrongful death. If your loved one died in any of the accidents described above or because of another form of negligence, then your loved one’s estate could have a wrongful death cause of action. To schedule your own free consultation after any of these types of incidents, we encourage you to contact us online or by phone at 800.800.5678 to schedule a free, confidential, no-obligation consultation with an experienced Illinois lawyer. We would be pleased to meet with you at any of our convenient Illinois locations in Bloomington, Gurnee, and Rockford and to discuss whether you have a personal injury case worth pursuing.